This entry was posted in Birds (鳥), Photography (写真) and tagged カワセミ, birds, blue jewel, common kingfisher, 翡翠, 野鳥, 青い宝石, kingfisher, 小鳥 by T Ibara Photo. Bookmark the permalink. Really beautiful post. Communicates that feeling of freedom. Wow, this is a spectacular shot, Takami. Simply stunning, Takami 🙂 Your prowess with the camera and capturing your wildlife friends is extremely impressive ~ wishing you a great weekend. Wishing you a wonderful weekend too! Haven’t seen a kingfisher in years and now I’m seeing double! Great catch! Kingfishers are such beautiful birds. I look forward to viewing more of your son’s lovely bird/nature photography! What a wonderful reflection in the water! Kingfishers are often described as "flying jewels" in Japanese. I thought this image would portray that expression – at least I hope it did 🙂 Wish you a happy weekend. Thank you for your kind words! It’s much appreciated. I always look forward to viewing your work. Hope life is treating you and your family well. Wow! 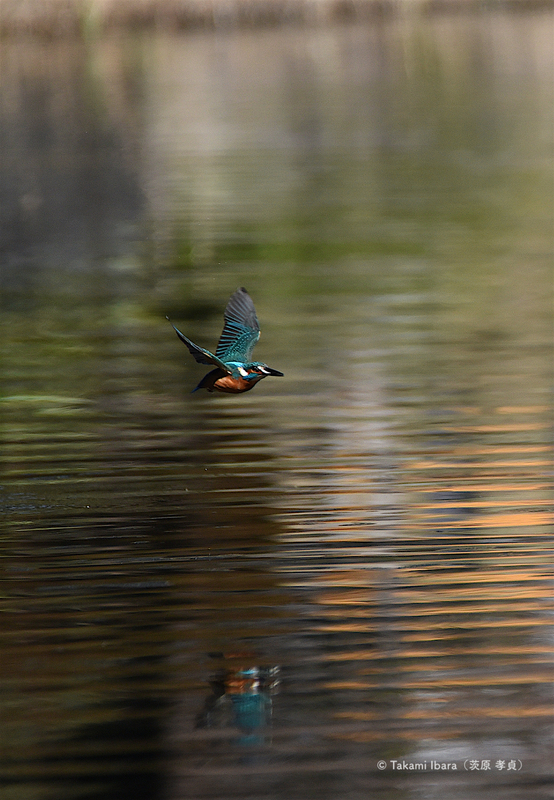 Was it hard to capture this kingfisher in flight? Hello Josh, thanks much as always. It’s “hard” because they move so quickly and it’s a challenge to follow them with a big lens. (All of my photography is done without using tripods nor sighting devices😁) So it’s a real challenge to keep a steady hand while making sure the bird is in-frame. It was “easy” this time, because I lucked-out in my assumption that he’d be heading my way and that he’d fly parallel to the pond with its colorful reflections. I couldn’t imagine shooting with a long lens without a tripod! I struggle to hold even a lightweight camera steady! I’m absolutely sure you will have have no issues with hand-held cameras. It just takes some patience and getting used to! Haha I could never film wildlife, so many hours doing nothing! Another treasure to behold! Captivating. Nature never fails to amaze and humble. Really appreciate your visit and kind feedback.